For those of you who read the Lynne Cox book, the first attempt (12 mile distance from Anacapa) by David Yudovin is covered in her forward. David went down near the beach, nearly drowned, serious hospital time, etc. 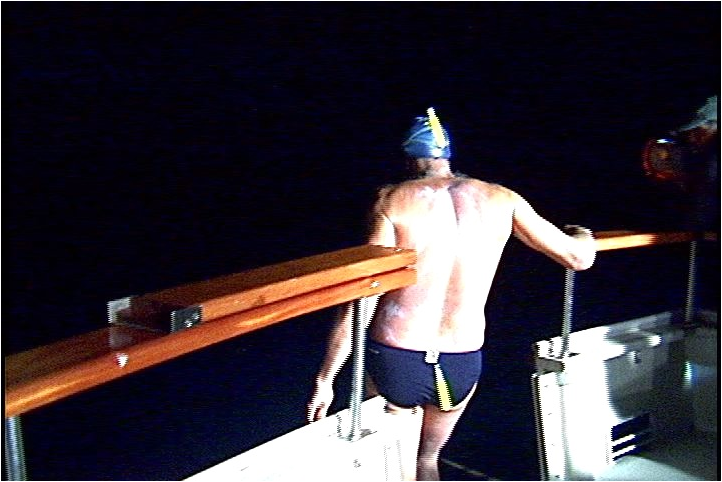 David later completed this crossing plus the 19 mile crossing, the English Channel, 4 Catalina crossings, Cook Strait and many others, and is in the International Marathon Swimming Hall of Fame. 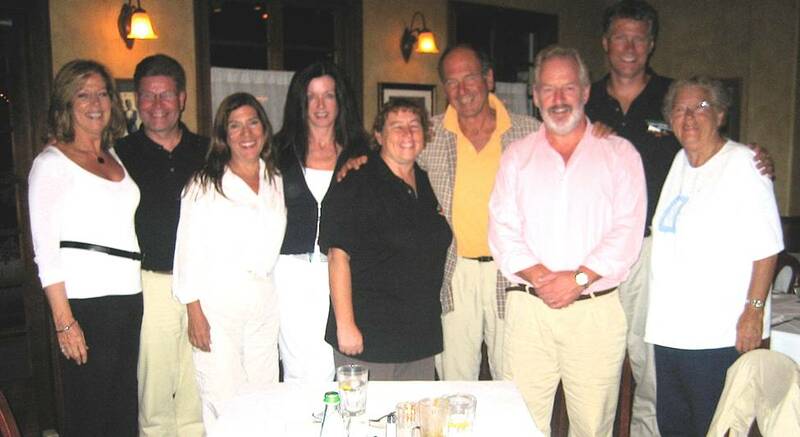 David and his wife Beth (one of the most experienced open water boat crew in the world) flew in from Hawaii to be part of my crew. And with encouraging worlds in the previous ten days from three other Hall-of-Famers: Kevin Murphy (34 English Channel crossings), and the Streeters (Alison 43 English Channel swims and Freda), I had nearly royal encouragement. Santa Barbara is a fantastic place to visit (we want to move there!) 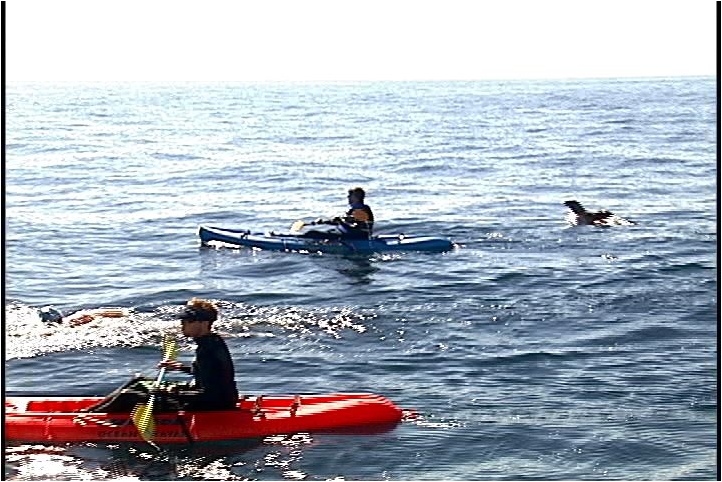 and the local swimmers and kayakers hosted us very well. The channel association is new and Paul and I were the first swimmers – so call it a honeymoon period for visiting swimmers! My plan was to attempt the 24 mile crossing and I fantasized about beating Paul’s time! When we reached Santa Cruz Island at 11 pm force 5 wind was blowing from the west (left) and even though Paul had started in similar conditions, I opted to wait two hours. Conditions then worsened and the boat captain would not let me get in the water (I didn’t get a choice … but I don’t think I would have started). Paul had opted to use a local crew in a sail boat – but I went for an experienced Catalina crew/boat which came up from Los Angeles. That North Channel crossing of Paul’s probably added a bit of extra confidence which I have yet to find! David then suggested that we move to the 19 mile crossing – which would offer some protection from the wind. Eventually at 5:30 am the wind lessened to force 4 and I started with a wall (cliff) touch, aided by two kayakers. The wind was now from behind giving me a bit of surf for the first few hours. Dawn broke and I got sun … real sun! The wind died and conditions were fine but water temperature started at 15 C and increased to 16.5 C. I was treated to an above water flip by a seal which then swam under me and smiled. When I started to noticeably tire after 7 hours I was treated to the sight of manta rays swimming below. To get the best view I stopped completely and just hung face down in the water. They took off on the sound of a giant crash as one kayaker launched himself into the water (the boat crew thought I was drowning). I looked up before any touch and the crew (led by my wife) withheld candy on the next two stops as punishment for scaring them! 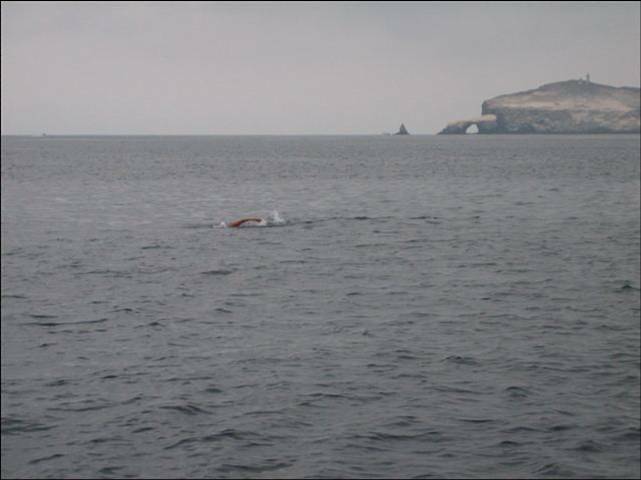 Between the swim focus and the wildlife – I missed the great view (the picture of a later swimmer) as we passed Anacapa Island. Two miles from the coast the temperature dropped to 15.5 C and I suffered a face on current. The current was strong enough to only allow 300 meters progress in 30 minutes. David jumped in to swim along and eventually we made the breakwater. From there it was surfing in with the waves until my hand touched. The knees were wobbly as I staggered out. With the boat out ½ mile or more and only a kayak as possible transport – going back wasn’t the best option. I was “escorted” to the frontage houses where an outdoor hot shower and blanket appeared just about at the same time as the paramedics (two red trucks with flashing lights). At this point my wife (on the boat) forgot about the manta ray episode as she feared the worst. The kayaker didn’t like the fact that David was shivering but I was beyond shivering (I hadn’t felt cold) and called 911. Off to the hospital with a core temperature below 90 F (32 C) and I spent the next five hours recovering from hypothermia and something called starvation ketosis – poor feeding it seems. With all the delays in starting (and my fear of sickness on the boat – it was 15 hours from my last meal to the start of the swim). My wife and the Santa Barbara Channel Swimming Association President, Emilio, went to the wrong hospital first but eventually found me and even brought clothes! Unfortunately this was 1/3rd of the relay team and hence the relay was cancelled. I was in the water 10 hours and 27 minutes … and broke David’s previous record by just under 5 hours. My time was later recognised as a world record and has held for the first five years anyway! One of the funnier things happened (as reported to me later) in the second paramedic truck (a kind of red boxy ambulance). They gave David, Ben and the kayak a lift to the pier to be united with the boat. The older fireman/paramedic was taking about this bringing back memories from more than 25 years ago when he was a life guard and saved some guy who went down swimming from Anacapa. David then dropped his chin and slowly lifted his arm … then smiled and thanked him! Alison and Freda Streeter had been waiting on the pier for the finish – and joined us all for dinner the next evening (and presented me with a signed chart). Paul Lewis called with congratulations the next morning and the crew had a big dinner two nights later. I started the swim 15 pounds lighter than I was before my 2005 English Channelswim. The colder water, delay in starting and reduced insulation took its toll. For me it was a harder swim than the English Channel. 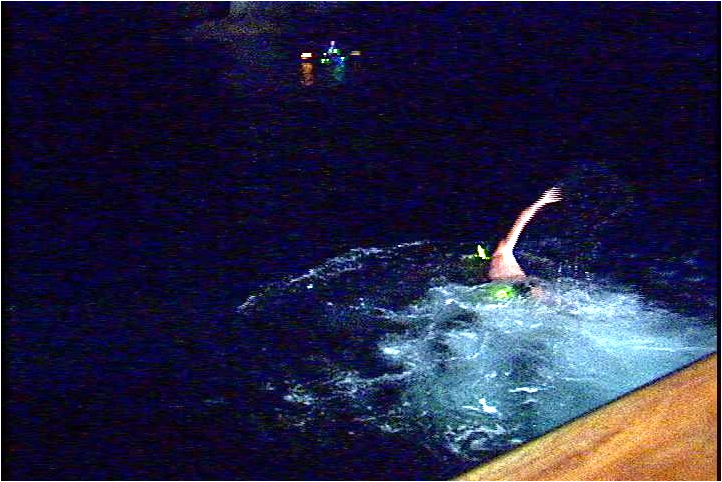 The Santa Barbara Channel swim was a great experience and I look forward to its increased popularity. 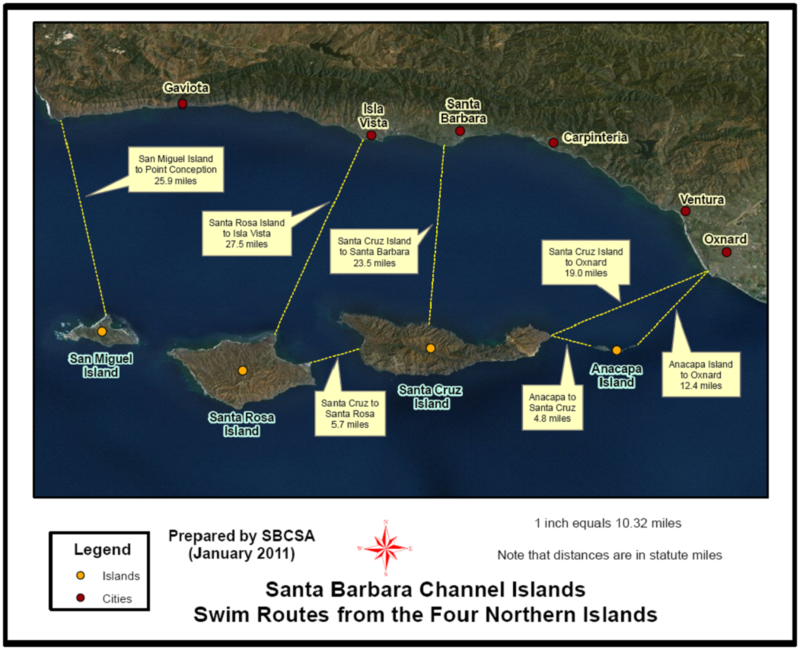 For more information, see the Santa Barbara Channel Swimming Association website.